Photo courtesy of BBC/Chris Christodoulou. Photo: Barbara Hannigan performs Hans Abrahamsen’s let me tell you with Mirga Gražinytė-Tyla and the City of Birmingham Symphony Orchestra at the BBC Proms 2016. 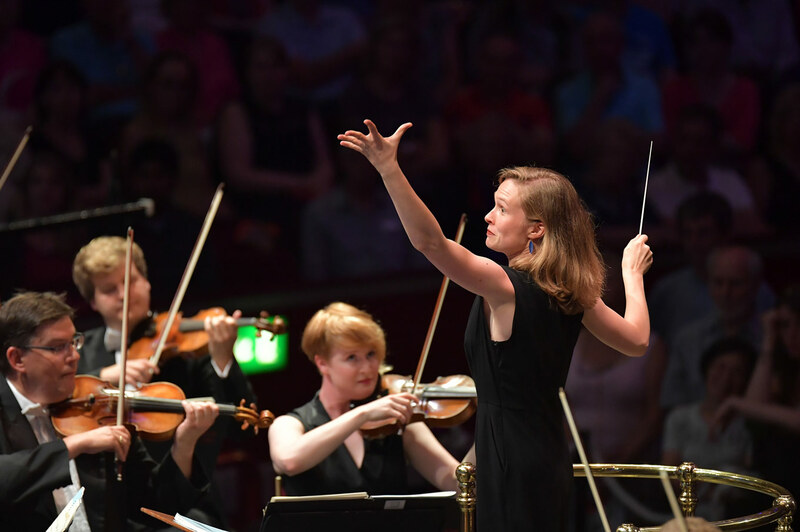 Saturday night was BBC Prom 55 at the Royal Albert Hall; the City of Birmingham Symphony Orchestra, under Lithuanian maestra Mirga Gražinytė-Tyla, shared the stage with Canadian soprano Barbara Hannigan for what was an evening of firsts. The 30-year old Gražinytė-Tyla is the newly appointed music director of the CBSO, and she had an exciting London debut with the BBC Proms. She was a ball of energy, athletic with her gestures, one of those conductors that makes you hear all the hidden inner lines in an orchestra. She led them through the overture to Mozart’s The Magic Flute and Tchaikovsky’s Fourth Symphony, inspiring enormous fortes and impossibly small pianos, almost like a challenge to the orchestra. Mirga Gražinytė-Tyla conducts the City of Birmingham Symphony Orchestra at the BBC Proms 2016. Photo courtesy of BBC/Chris Christodoulou. Abrahamsen’s score is full of novel and surreal sounds, including an extraordinary moment of what feels like a heavenly choir and orchestra, shimmering with texture and treats for the ear. Throughout the score is a vocal motif, stretching words through repeated syllables, almost like a slow-motion version of a Baroque goat-trill. The word-painting is thoughtful, and the entire piece has a moment of stillness, evoking an Ophelia that is less plagued by insanity, and instead more contemplative, almost detached from the events she recalls - out of order as they may be - from Hamlet. 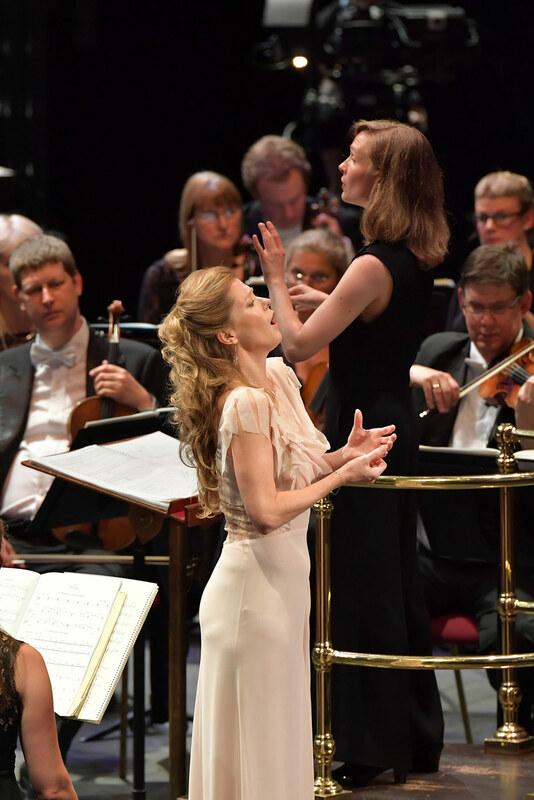 Barbara Hannigan performs Hans Abrahamsen’s let me tell you with Mirga Gražinytė-Tyla and the City of Birmingham Symphony Orchestra at the BBC Proms 2016. Photo courtesy of BBC/Chris Christodoulou. Perhaps it was the size of the venue, but there was something that felt stuck about let me tell you. The composition devices, the musical motifs, the consistency of pulse, they seemed to run out of direction, as though the affect wore off and became ineffective. It’s clear that Abrahamsen made a decision to maintain a still texture - reminding us often of Saariaho’s music; the text itself was hard to get solely through listening, made more difficult by the nature of his text-setting. Often we were left with only an atmospheric effect, instead of clearer text to guide us through the cloudy (and beautiful) orchestral sound. It was one of the subtler performances we’ve see of Hannigan’s, and she’s still a riveting figure onstage. Without paring down the orchestra, we’re curious to hear let me tell you in a more intimate venue. After this season, the piece will be available for other singers to tackle; it’s at this point in a new work’s development that it can expand and gain more context from varying artists. It certainly got us excited to hear Hannigan reprise the role of Agnès in George Benjamin’s Written on Skin, when the Royal Opera House revives Katie Mitchell’s production in January of 2017. Opera in concert: uncluttered or uninteresting?